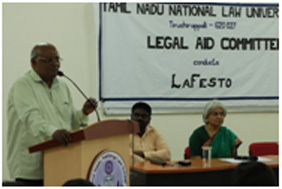 The Legal Aid Committee (LAC) of the Tamil Nadu National Law University was constituted in 2014, with a view to promote legal awareness among the generalpublic. The prime objective is to educate the weaker sections of the society on their basic rights and duties enshrined in the Constitution of India and various legislations. 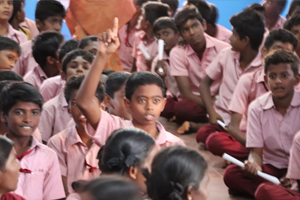 This objective is realised by conducting periodic legal awareness camps in schools and colleges in Tiruchirappalli. 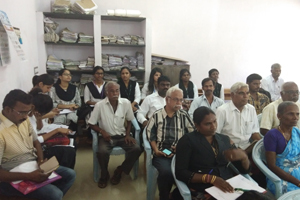 The LACis also committed to provide access to free legal aid,and to achieve the same, a Legal Aid Clinic (functioning every Wednesday between 3PM-5PM) has been set up in association with the District Legal Services Authority, Tiruchirappalli.Through these activities, the LAC seeks to bridge the gap between the existence and the realisation of legal rights. Lady Justice has always been lampooned for being blind to the truth, but how often do people know the way to carry it to her? The constitution of India under Article 39A, provides for free legal assistance to all its citizens. Upholding similar principles, the National Legal Services Authority (NALSA), the parent body of State Legal Services Authority (SLSA) and the District Legal Services Authority (DLSA) was established. They believe that no citizen shall be denied the opportunity of securing justice on any ground including socio-economic reasons. Legal aid cells at law Universitys help in inculcating a sense of social responsibility amongst the students. It is a crucial part of learning done at law University. 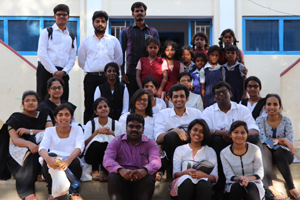 LAC, TNNLU, a student run body was established in November, 2014 with an objective of extending legal help to the needy and imparting legal awareness. 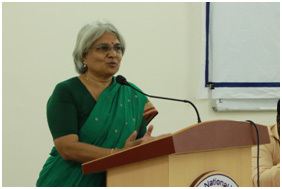 The Legal Aid Committee (LAC) of the Tamil Nadu National Law University successfully conducted its 3rd Intra-University Legal Fest, La Festo 2019 between 15th and 17th February, 2019. The fest served as a platform to the students of the University to showcase their sleuthing tactics, writing skills and legal awareness. 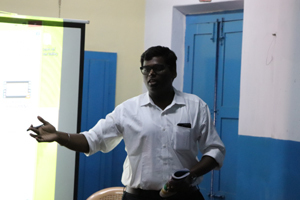 The various events conducted include Law Quiz, Crime Scene Investigation, Minority Opinion Justification, Street Play, Dum Charades, Extempore, Judgment Translation (in Tamil and Hindi), RTI petition drafting, PIL drafting and Poster Presentation. The event was a success, as it saw participation from over 200 students from within the University, with the first year students being very enthusiastic. The valedictory session was presided over by our Hon’ble Vice-Chancellor and Prof. Dr. N.S.Soman, who congratulated the prize winners and distributed the certificates. Overall the event introduced and created a platform for the students to show as well as learn the various skills necessary for a greater interaction with the society. The Legal Aid Committee (LAC) has undertaken to reach out to the rural population in and around the University campus and aid with their legal and other problems at the grassroot level. 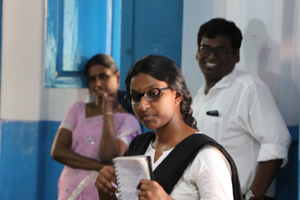 In order to achieve the objective, a team consisting of 40 students including the members of the Legal Aid Committee along with the faculty in-charge had conducted the Legal Awareness Rally on 18th September 2018 in the village of Inamkulathur (From Othakadai bus stop to Government Hospital). The rally was graced by the presence of the Chief Judicial Magistrate (CJM) Mrs. Hemalatha who waved the rally to a start. Throughout the rally, the students cheerfully sloganeered about the Free Legal Aid Clinic that is effectively functioning in our campus. As a part of rally, the students entered the weekly market and distributed pamphlets to the vendors and as well as the general public informing the same. The legal profession is dedicated to arriving at viable solutions to diverse legal issues. 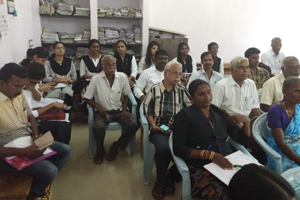 On September 8, 2018, the District Legal Services Authority of Tiruchirappalli organised a National Lok Adalat in the District Court, Tiruchirappalli. 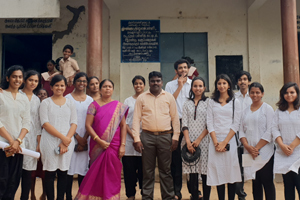 A nine-member team comprising of members of the LAC and other student volunteers’ from TNNLU, along with the faculty in-charge Dr. S.K. Balashanmugam, attended as observers’ to watch the proceedings. The inaugural ceremony was presided over by the Principal District Judge Thiru. S. Kumaraguru, fellow Hon’ble Judges and Senior Advocates of District Court, Tiruchirappalli. 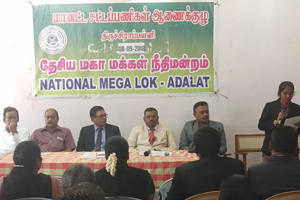 The National Lok Adalat was held across seven Committees dealing with Civil Suits, Bank Suits including default in Payment of Educational Loans, Business Loans, Labour Disputes, Motor Vehicles Accident Claims, Insurance Claims and Matrimonial Disputes. 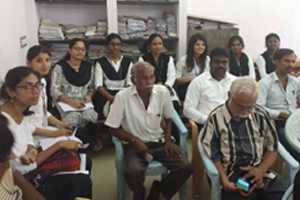 A team consisting of eighteen members of the Legal Aid Committee along with the faculty in-charge had conducted a “Legal Awareness Camp” at the Holy Family R.C. Higher Secondary School at Ammapettai, Manikandam Block on the 7th of September, 2018. 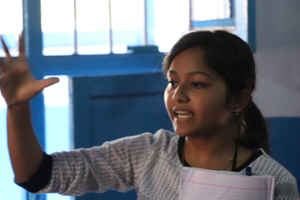 The aim of the program was to create legal awareness among the students of Classes VIII & IX about specific rights available to them under various legislations. 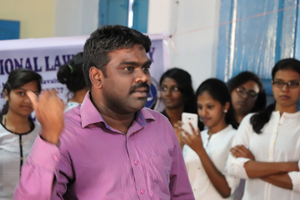 Our faculty in-charge Dr.S.K.Balashanmugam initiated the session by addressing the students who were about two hundred in number, about the basic rights available to a citizen under the Constitution of India. The student members discussed a certain area of law namely Right to information, Domestic violence, Narcotics, Road safety measures. A few members enacted a play and performed a mime on Protection of children from sexual offences and Rights of arrested person, respectively. Two short films, on Cyber-crime and Sexual harassment at workplace, made in association with TANII were also screened. The students were very inquisitive throughout the session and a particular student posed a lot of questions to the speakers. They were able to answer most of the questions put forth by our members and a few students who gave impressive answers were given chocolates as a token of appreciation. 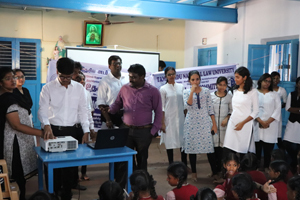 A team consisting of twelve members of the Legal Aid Committee along with the faculty in-charge had conducted a Legal Awareness Camp at the Government Middle School at Navalurkuttapattu on the 27th of August 2018. 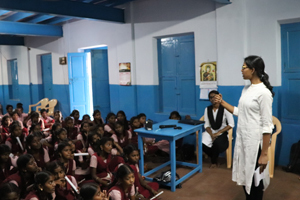 The primary objective was to create awareness among the students and informing them of the basic rights and protection available to them under various legislations. On our arrival, the Principal Mrs. Juliet, gave us a warm welcome and introduced us to a group of sixty students from classes VI to VIII. Our faculty in-charge Dr.S.K.Balashanmugam addressed the gathering regarding the fundamental duties of a citizen towards the society. Each of the members discussed a particular area of law including Right to information, Domestic violence, Drug abuse, Cyber-crimes, Helpline numbers and Welfare schemes available to the students. 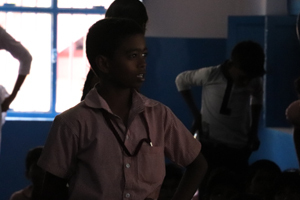 One of the components of the camp included a role play and a mime show on the Protection of children from sexual offences and Rights of arrested person, respectively. A short film, on the protection of rights of senior citizens, made in association with Tamil Nadu Innovative Initiatives was also screened. 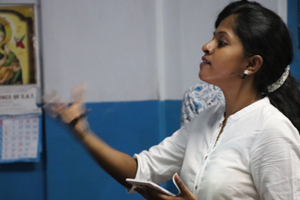 The students were very interactive and enthusiastic throughout the session. In order to ensure active participation among the students, questions related to the activities conducted at the camp were posed to them and students who correct answers were given chocolates as a token of appreciation.